Yesterday, Jonathan Autry's lawyer (his brother Joshua) filed a motion with the United States District Court in West Virginia, asking the court to require Ergun Caner to pay for Jonathan's legal expenses in defending himself from the frivolous copyright infringement lawsuit brought by Caner. Caner's lawsuit was tossed out of court on summary judgment by Judge Norman K. Moon just a few weeks ago. 2. Caner made it clear that in settlement that he only cares about criticism. 4. Courts have found bad faith and improper motivation in similar cases. Jonathan requests this Honorable Court award him $29,314.59 for fees and costs. Joshua Autry references an email list of questions from Caner's lawyer as evidence that Caner's motive in filing this lawsuit was to suppress dissent, not to protect his copyright. You can read this email here, along with Jonathan Autry's responses to each question. In these questions, Caner himself wanted names of people who had criticized him. Caner wanted copies of correspondence between Autry and Caner's other critics. 4. How coordinated is this? Under FBCJaxWatchdog and James White? 5. On your blog you state an LU high official told you that Caner "privately repented at Thomas Road Baptist Church," but that he was afraid to do so publicly because of the bloggers. Caner would like the name of this “high official.” If a name is not provided, then please publicly state that the statement was not made truthfully. 6. Who was and is your immediate supervisor at LU? 7. You mentioned on your blog that you had help, who else at LU worked with you on these matters? This is chilling. Caner shows his hand. His lawsuit was not about protecting his copyright. It was about bullying information out of Jon Autry regarding his critics at Liberty University, and various bloggers who like Autry have sought to expose Caner's deceptions. "This hyperbolic rhetoric [use of the word "cyber terrorist" to describe Jon Autry] defies all notions of professionalism, and—although I lack the lengthy career and prestige of opposing counsel—I have never heard an attorney speak in such terms about a party in open court. I say this in spite of the fact that I have represented people accused of murder and sexual assault, but I suppose prosecutors live under ethical guidelines that are unfamiliar to copyright litigators. This conduct was another attempt to distort reality and to keep the eyes of this Court off of Caner’s own wrongful conduct through misdirection and trickery." "In hypocrisy, Caner extols the virtues of free speech, but seeks to restrict speech directed at him....in line with this double standard, it appears that Caner currently uses the logo of HBO's Game of Thrones series without permission. [footnote identifies this Watchdog blog post]. Apparently, copyright protections - like free speech protections - only matter when Caner is the one benefiting from them." So, Westside Baptist Church in Gainesville, you can take pride that your Youth Camp logo tweeted a few weeks ago by youth minister Asa Walker is used in federal court as an example of Ergun Caner's hypocrisy. 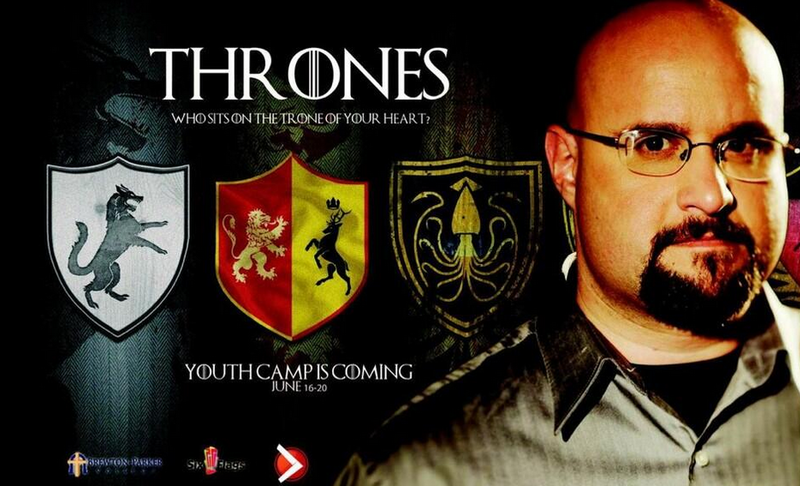 I still have not heard back from Walker or from Phil Young as to why they chose Ergun Caner as their youth camp leader. Lastly, any one who values free speech owes a big "Thank You" to Jonathan and Joshua Autry for putting up such a skilled defense to Caner's frivolous lawsuit. This was definitely a David vs. Goliath fight - and David won. "Frivolous copyright actions in the fair use context threaten to chill criticism. That was precisely Caner’s goal. If successful, Caner would be able to remove works from the public eye (his and Jonathan’s). The Copyright Act seeks the opposite: to facilitates the creation of works and permits others through fair use to build off of and respond to those works. Caner needs deterrence as well. He is likely to file other lawsuits. He has already sued two people in this case alone. Further, he threatened Jonathan with filing a series of defamation lawsuits with the likely result of bankrupting the defendants. This Court should reward Jonathan for not buckling under the pressure and for litigating a valid fair use defense. Like a civil rights victory, a fair use victory protects the speech rights of all. In the world of the internet, courts rely on one another from across jurisdictions from coast-to-coast more than ever. In addition, religious media and bloggers have followed this case. Fees send a signal to encourage free speech by the little guy in the face of litigation. If Jonathan rolled over and took a default judgment, not only would Caner have sought a fee award of his own that Jonathan could ill-afford to pay, but Caner may have used the litigation as support and motivation for lawsuits against other critics. Defense fees, however, will deter Caner and others like him from filing copyright actions to hide their words." Jonathan and Joshua Autry, job well done. You have fought the good fight, and bloggers who seek to speak the truth about powerful religious men and their institutions, owe you a huge debt of gratitude. And we now await the next round of lawsuits. Thank you for posting this. We now have had two federal courts rule that Caner was seeking to prevent people from accessing proof of his lies. That was the only possible justification for suing over the video tape of him produced by the Marines. Caner is now 0-2, and his plan to sue those who tell the truth about him into bankruptcy may well backfire and hopefully result in him no longer having the funds to hire attorneys. What is baffling is the reality that GA Baptists are gladly footing the bill for this nonsense. Nearly $30k on one lawsuit! My assumption is Caner's bill for Smathers' fees would be similar. How does this man afford to blow $60k? GA Baptists are footing the bill for a man to keep up two homes (TX & GA) and still have enough discretionary income available to throw $60k away in frivolous, indefensible lawsuits. Insanity, thy name is SBC. If Caner files more lawsuits, he's not just a scoundrel, he's a fool also. I expect that he's going to get smacked down pretty soundly by the judges in these two cases when they issue their opinions on the motions for fees. I especially believe Judge Moon is going to pull out all the stops. He all but said in his opinion on the motion to dismiss that Caner's case was frivolous and was filed in bad faith. Attorney David Gibbs should be ashamed and embarrassed by his involvement. He was not defending an accused pastor like his dad used to do. He was the aggressor, and as the judge stated, brought frivolous charges against a brother in Christ. His briefs and oral arguments were incomplete and poorly supported by any case precedent. He was used by Caner. He should have known better. As a Christian attorney, I no longer have any respect for David Gibbs, his firm, or his father. This really exposes who they really are. Sad. One positive for Gibbs...he should have his phone ringing off the hook from other such charlatan bullies who need a lawyer like him. And there are many! Go get em Dave. You are now in much higher demand. The dirtiness from Ergun Caner and company just keeps getting deeper and deeper. It might just keep getting dirtier. I for one can't bear to touch it. I can't address those in the Caner camp on anything for all the dirt and lies, having read a post full of them again the other day and today. Any thinking, rational person knew from the beginning this was about silencing critics so Ergun would be free to rise to fame again in the Christian community. There's song lyrics that come to mind. "When will they ever learn? When will they ever learn?" It's been 4 years and counting now. Lies are lies. Ergun lied.Those defending him are lying. When 2 judges give rulings and opinions as these two judges from different states have given, including their opinion of Ergun's lawyer,which corroborates what we already knew and wrote on, you would think that would shame them at the very least. I also wanted to thank Jason Smathers and Jonathan Autry for enduring a very difficult and costly trial. It will set a precendence as have Watchdog and others who dare to go against the so called giants. Some have won, some have lost, but it was still worth doing. Thank you. I would not have had the fortitude shown by the above. Jason Smathers - AOL Guy? Is that the same Jason Smathers? This Jason Smathers hurt a lot of people. The court case isn't in West Virginia but in "Western Virginia" which is a district in the state of Virginia. I do believe this is the same guy, but do not see how he hurt a lot of people. While he did wrong, I can not find how he hurt a lot of people. He simply sold email addresses that he had harvested from aol.com. This is what yahoo, msn and other companies do on a daily basis. Does not justify it, but I do not think he hurt a lot of people. The company lost shareholder value. People lost jobs. Not quite victimless. I have been waiting to comment on Jason Smather's past hoping that those who bring it up, which is no surprise cause that is what you guys do and why I fight you guys, is unlike Ergun, Jason Smather's has been nothing but open and honest about his past. Unlike Ergun Jason Smather's has repented and paid the price by doing the time for his past. He is forgiven, unlike Ergun Caner who continues in his deceit and attempted bullying of scrubbing the internet of his past with no repentence or stopping of his lies. Now I will stop for now, but if I read any more bashing of Jason on his past, I would suggest a reading of his blog on the subject. Now stick that in your blind site. My last comment should have read, hoping those of you who bring up Jason's past would be honest enough to realize this was before Jason was a Christian. In fact Jason's story is a story of what Christ really does in a person's life. Not make them into a tatooed, warrior,but change them to love truth, people, and Christ himself. Read what true redemption is.